At a time when most Christians never considered the millions of people in other countries who didn't know Jesus, William Carey (1761-1934) dedicated his life to bringing the Good News to people who had never heard it. Leaving his familiar life in England behind, William sailed to far-away India on a missionary quest filled with heartache and victory. 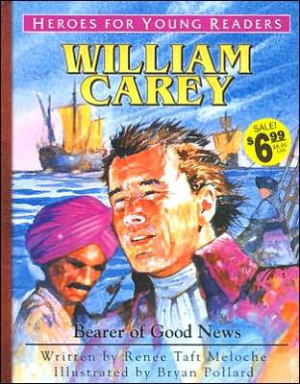 William Carey: Bearer of Good News by Renee Taft Meloche was published by Frontline Communications in August 2002 and is our 45867th best seller. The ISBN for William Carey: Bearer of Good News is 9781576582367. Be the first to review William Carey: Bearer of Good News! Got a question? No problem! Just click here to ask us about William Carey: Bearer of Good News.